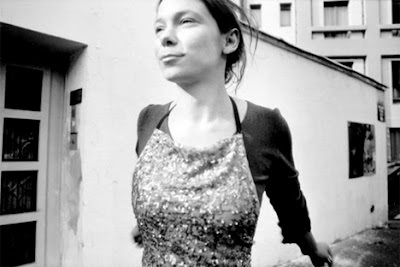 For the past five years or so I have been listening to Lhasa de Sela sing, her smokey voice drifting like a tendril from my stereo into my ears: I wandered around the world, took off in airplanes, saw the clouds roll by, walked for hours with nothing but bare tree branches and her voice in my head, in my eyes. I think I always start to see the world in the color of the music that I hear. After listening to this heartbreak of a song, I was floored and I wanted to hear more so I went to her website. There, it struck me to read that she had died of breast cancer at the beginning of this year, January 1st, 2010. And isn't it strange and wonderful how music, songs, films, thoughts, words, people, conversations, and such and etcetera come together at times and seem to make a cohesive sense to your heart of hearts when it is in a moment of bottomless confusion, angustia, crisis, trembling at the edge of where it will not run out into the words that we desperately use as we try to find relief, release from the pressure, that's when some one offers us a song. You find yourself having a cup of tea with a man old enough to be your grandfather, but he is a man out in search of love again nonetheless, despite everything, eyes wandering, a gentleman. He wears an ivory, glittery, feathery cake shaped hat. His shirt has flowers and shiny buttons. You tell him that you like it. He says he'd hoped you would. And he said to me, "every opportunity presents itself in this life, you just have to be open to it." And I watched him skeptically. His eyes deep wells of wisdom, were they? Or, is it easy to say such a thing once you are on that end of life, once you have made it to the other end? Is it easier to say that it is all there for you, that life was and is always giving. You just have to keep your ears and your eyes and your mouth and your heart open? Llhasa de Sela...I never met you, I never saw you, I do not see you, I will never meet you. yeah. i am listening. she is really great. Thanks for the post and for her.